HSSC TGT Result 2019 Cut-off Marks, Interview Dates 2019. (Last Updated : 14.11.18). Download HSSC TGT Result 2019 Scrutiny Schedule, Cut-off Marks & Interview Letter 2019 for various posts. Haryana Staff Selection Commission (HSSC) Result of TGT Screening Test February 2016 against advt. no. 3/2015 & 9/2015 can be checked here. HSSC declared final and screening result for scrutiny of documents for the post of TGT Science (Haryana & Mewat Cadre). Check latest updates on TGT English, Urdu, Music, Home Science and Physical Education (Rest of Haryana & Mewat). Candidates can check their result and cut-off marks after the declaration of TGT Result 2018. Interview Letter for the post of TGT will be issued only to the qualified candidates in screening exam after scrutiny of documents. HSSC conducted TGT Screening/written exam February 2016 for the post of TGT Science, TGT English, TGT Home Science, TGT Urdu, TGT Music & TGT Physical Education for Haryana & Mewat Cadre on 14.02.2016 & 07.02.2016. Download here HSSC TGT Screening Test Result 2018 Cut-off Marks and Interview Schedule 2018. Merit list and selection list for TGT English, TGT Physical Education, TGT Science, TGT, Urdu, TGT Music & TGT Home Science can be checked here as soon as they are available on official website of HSSC i.e. www.hssc.gov.in. HSSC on 14.11.2018 released Scrutiny Schedule for absent and newly HTET passed candidates for the post of TGT Physical Education (Haryana Cadre). Earlier, Final Result after Interview for the post of TGT Science (Rest of Haryana) was declared. Document verification was held from 23.08.2018 to 24.08.2018 for Haryana cadre and 30.08.2018 for Mewat cadre as per the schedule. Screening test result before scrutiny of documents for the post of TGT English & Physical Education was earlier declared by HSS on the official website. HSSC TGT Result has been declared with Cut-off Marks of every subject and category. Candidates can check subject-wise and category-wise cut-off marks of TGT Screening Result 2019. TGT Interview Schedule has been declared along with TGT Screening Result. Candidates can download their Interview Letter / Admit Card for Viva-voce for the post of TGT as per the schedule to be uploaded by HSSC. HSSC will declare the final result of TGT Recruitment 2016-17 after the successful completion of Interview. Download HSSC TGT Interview Admit Card 2019. HSSC will issue interview schedule / notice for the post of TGT under advt. no. 3/2015. HSSC TGT Admit card 2019 for various posts of TGT are available here to download. The candidates who qualified in HSSC TGT Written Exam 2016 can download their admit card as per the schedule given by HSSC. As HSSC conducted screening test for the post of TGT against advt. no. 3/2015 & 9/2015. Screening Test Result 2016, cut-off marks and interview schedule will be released shortly. So, the candidates who have passed HTET after the last date of submission of online application form for the post of TGT under advt. no. 3/2015 and 9/2015 can submit their HTET passed details from 21.03.2016 to 31.03.2016 (given one more chance from 04.07.2016 to 07.07.2016) through official website of HSSC. Candidates are also required to upload image/photo-copy of HTET Certificate at the website. Here is the detail. Download HSSC TGT Answer Key 2016 and HSSC TGT Question Paper 2016 for screening exam of TGT conducted by HSSC. Here you can download recent answer key and question paper of HSSC TGT English, Science, Music, Urdu & Physical Education Exam Feb. 2016. HSSC Admit Card for TGT Science, TGT Urdu, TGT Home Science, TGT Music & TGT Physical Education Exam 14.02.2016 can be downloaded from 09.02.2016. HSSC TGT Science admit card for Written Exam 07.02.2016 were available from 02.02.2016 through official website of HSSC i.e. www.hssc.gov.in. HSSC released written exam schedule for the post of TGT against advt. no. 3/2015 for Haryana and Mewat Cadre. TGT Science Written Exam February 2016 will be held on 07.02.2016. Here is the detail of Haryana TGT Exam Schedule 2016 for the post of TGT Phy. Edu., TGT Music, TGT Science, TGT English, TGT, Urdu & TGT Home Science. 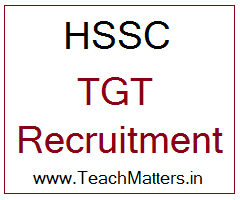 Punjab and Haryana High Court on 21.09.2015 banned HSSC TGT Recruitment of 1919 posts. Haryana Staff Selection Commission has uploaded the fee confirmation list for the post of Trained Graduate Teacher (TGT), Advt. No. 3/2015 and 9/2015 (TGT English Mewat Cadre). The candidates who applied for the TGT post, can check/confirm the list of candidates whose fee is confirmed. Note : The candidate who has deposited the fee in the designated bank and his/her name is not in the list are requested to mail the fee deposit proof (i.e. fee challan) on recruitment‐portal@cdac.in on or before 18/12/2015 upto 5 pm. Haryana Staff Selection Commission (HSSC) invited Online applications for direct recruitment to 1919 Posts of TGT (Science, Urdu, Physical Education, Home Science & Music) (Group‐C Services) through the website of HSSC i.e. www.hssc.gov.in. The online application can be filled up from 21st August 2015 to 21st September 2015 (extended upto 12.10.2015) thereafter website link will be disabled. The candidates were strongly advised to apply online well in time without waiting for last date of submission of online application. The printed copy of the online form with necessary certification will be brought at the time of interview/ verification. Note- The candidates those who are having/passed HTET till the date of interview after advertisement will be allowed for interview on the basis of acquiring HTET (Test) till the date of interview.. Essential qualification (EQ) is given with each post. For full detail click the following links to see the original advt. Sir m unable to find the link from where i submit my htet details. HSSC TGT English Result has been declared. You can see the result at the link given above. Sir, i have misplaced my hssc roll no advt. No 3/2015 cat. 6.. how can i find it.. i have registration no. And password.. I misplaced admit card of tgt science screening test advt. 3/2015.how can i find out?